SOILWORK - VERKLIGHETEN LTD. EDIT. (DIGI) | Online Shop | Wizard LTD. Album: "VERKLIGHETEN LTD. EDIT. 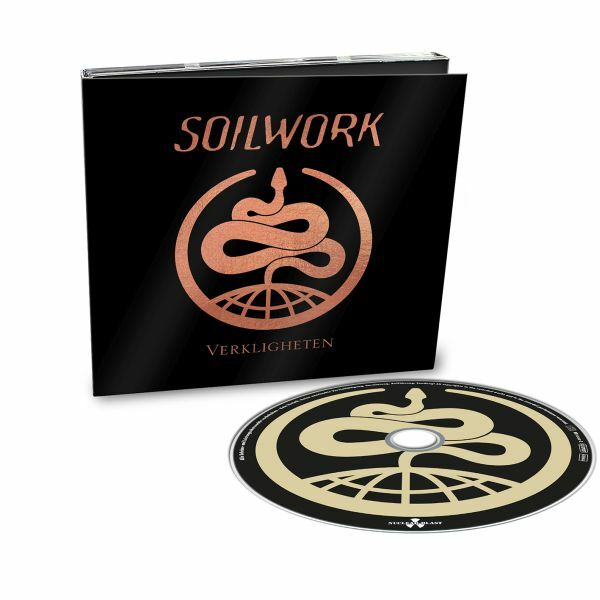 (DIGI)"
- SOILWORKS REALITY IN THEIR MELODIC WAY WILL LEAVE AN UNFORGETTABLE IMPRESSION! SOILWORK is a band that has been through a lot. We don’t have to try and tidy things up by using clichés like personal and/or musical differences. It has been hell. We have lost loved ones and significant others have fallen ill. We are not young anymore, and our reality these days is the hellhounds on our tails, the ghosts in our subconscious and the coldness of existence that starts eating at your soul the very day that you leave the womb. We can no longer escape the fact that we’re vulnerable to the shortcomings of life itself. Verkligheten is the Swedish word for reality, the entity that we’re all trying to escape from. Verkligheten is our attempt to try and go somewhere else, to express all those things that are born in between hypnagogic states and frenzies of hyperrealism. Verkligheten is the otherworldliness of Swedish suburban anxiety, accompanied by blastbeats and slide guitars. We also have a new drummer. His name is Bastian Thusgaard, and he made us all realize that there were still places we hadn’t been, sonic vistas left untouched by the greedy hands of the present. So we went there. Verkligheten is also Sven Karlsson, poker player and raconteur, who has witnessed things in the heart of the darkness in Malmö, and brings it all out in bursts of liquid fire over his keyboard. And Sylvain Coudret, the French silver fox who has laid continents to waste with his steely blue gaze and extraterrestrial guitar playing. One might also say that Verkligheten is Björn Strid and David Andersson, who sing and play guitar respectively, and who also wrote the songs this time around. Probably because they felt the pressure of Verkligheten, aching to burst from their tortured insides.